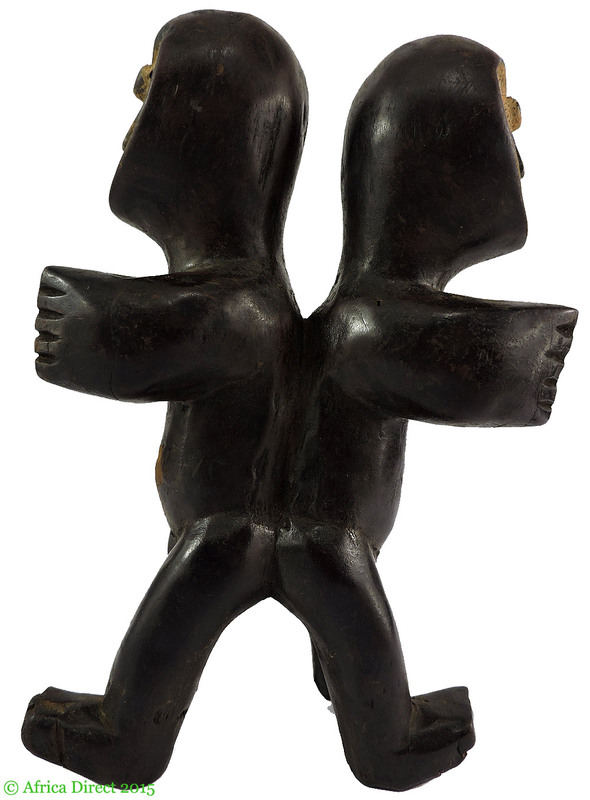 Additional Information: An interesting Lega figure with two people standing back to back. The white face and outstretched arms are the indicators of the hand of a Lega carver. Lega sculptures are usually carved in a highly distinctive style, with a heart-shaped concave face with a slightly bulging forehead, slit ‘coffee-bean’ or tubular eyes, a nose with a beak-like base, and an open mouth showing teeth. Figures may be covered completely in white clay called ‘pembe’ or simply as in this figure have the face highlighted through the use of coloring material. 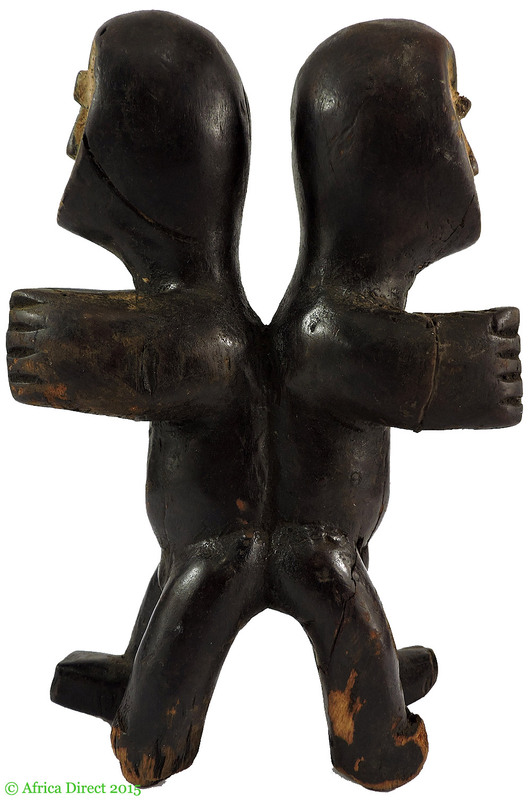 Such Janus figures were used during the initiation of Bwami society members, along with other figures and masks. 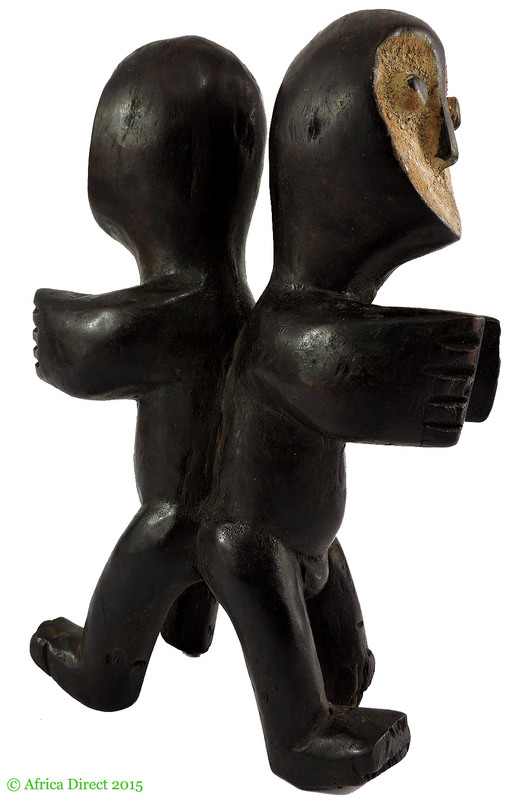 Among the Lega people of the Democratic Republic of Congo carved wooden figures are used during ceremonies of the Bwami Society, an initiation, and instructional society that governs and advises on moral and ethical conduct. The complex system of instruction, initiation, and advancement for both men and women in the Bwami society uses masks and figures to document the various levels of Bwami and to serve as badges validating the initiate’s knowledge of the secrets of Bwami and of their rank. Without knowing the exact circumstance and owner of a figure by Lega men or women it is difficult to determine their specific name or use as individuals will commission a sculpture for particular rituals or as badges of specific office or level attained in the Bwami society. Cameron, E. L. Art of the Lega, 2001. Cornet's A SURVEY OF ZAIRIAN ART_THE BRONSON COLLECTION.